Movie review of “Room”: A mother tries to make a life for her son — and escape from their sadistic captor — in this film adaptation of Emma Donoghue’s harrowing 2010 novel. Rating. 3.5 stars out of 4. Lenny Abrahamson’s wondrous, devastating “Room” is about a mother and son who save each other. In its early scenes, we see Ma (Brie Larson) and 5-year-old Jack (Jacob Tremblay) going about their daily routine: They do exercises; they tidy up; she tells him stories; he laughs; he throws an unremarkable tantrum; she sings a lullaby, gazing at him with weary love. Only gradually does it become clear exactly where this seeming normalcy resides — in one small, grungy room, locked from the outside, where Ma has been held captive for seven years. This is, of course, utterly horrifying. But “Room,” wisely adapted by Emma Donoghue from her brilliant 2010 novel, takes place almost entirely from Jack’s point of view, and to him Room is a magical place where he enjoys the undivided attention of his beloved Ma. We only see its hell in the gray pallor of her face, or in the expression that crosses it when giving Jack a new toy, indicating what she had to do to get it. (Jack rarely sees his captor; she hides her son in a closet when the man they call Old Nick appears.) Desperate to escape, she coaches Jack in a dangerous plan. “I want a different story!” he protests. “This is the story you’ll get,” she replies, determined to rewrite their fate. “Room” unfolds in two halves; inside Room, with its grubby walls and stale air, and outside it, as Ma copes with a rocky return to her old life and an astonished Jack faces a world he’s never known. It’s a tough sit, to be sure, but the performances are transporting: Larson never has a false moment, and Tremblay, enchantingly natural, holds the movie’s heart in his hands. By its lyrical end, you recognize anew the beauty of small miracles — sunshine, a backyard, a new morning, an open door. 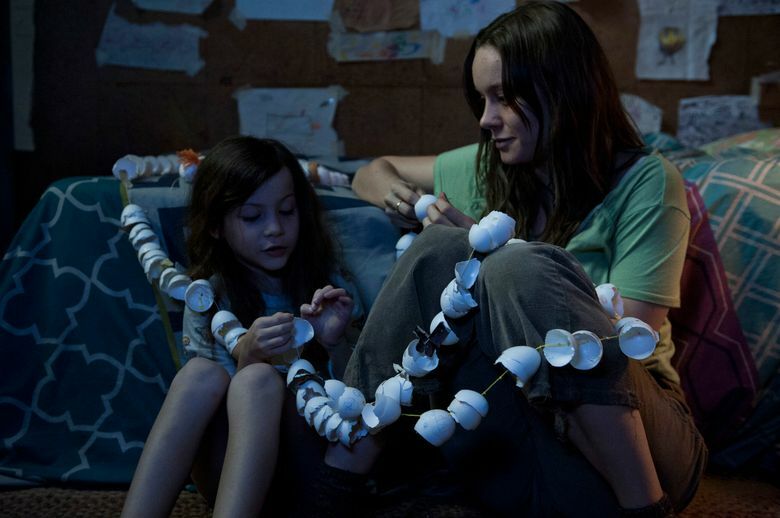 ‘Room,’ with Brie Larson, Jacob Tremblay, Joan Allen, Sean Bridgers, William H. Macy. Directed by Lenny Abrahamson, from a screenplay by Emma Donoghue, based on the novel by Donoghue. 118 minutes. Rated R for language. Several theaters.